The easy confidence with which I know another man's religion is folly teaches me to suspect that my own is also. I would not interfere with any one's religion, either to strengthen it or to weaken it. I am not able to believe one's religion can affect his hereafter one way or the other, no matter what that religion may be. But it may easily be a great comfort to him in this life--hence it is a valuable possession to him. So it’s a reality that Religion is totally an asset of an individual. One of the most popular religious scholars of Pakistan told a story of a person who belonged to Bani Isreal. He had been known for his bad character but Allah has for granted him HIS mercy and blessing just for his little virtue.. Unfortunately in Pakistan when we start criticism we start it from personal life. I am using the word “we” because I feel I myself commit it many times. If some one is your two times Prime Minister and a major leader of your country then what you think that he has no religion or has he not any attraction towards his religion? In the holy Month of Ramzan when Mian Nawaz Sharif went Saudia to perform Umrah many of anti PMLN people said that again he has gone for seeking a political benefit from Leadership of KSA. No doubt KSA is our elder brother and he stand by us in every difficulty. So first as a Pakistani I should be thankful to them and must respect him, secondly as worker of PMLN I am thankful to Saudia that they had respected my leader when He was deported by dictator Musharaf. But beside this fact as a Muslim I also have keen desire to visit Saudia and I believe every Muslim is well aware of the Importance of the Holly land of Makkah and Madina. No one can deny the peace and rest that one gets from this land even in most tensile circumstances. I prefer to visit Makkah and Madina on Switzerland. The people who were criticizing this holly tour are now a days giving lectures that religion is a personal matter but they forget when this phenomenon applies to PMLN and leadership of PMLN. 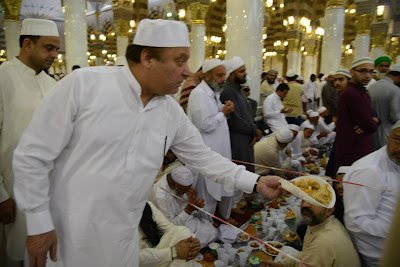 No matter what they think but as far as I know that Mian sb remain in ablution (long time ago he came on a tv program “Bachy Mann k Sacchy ” , he himself told this on screen ) and one of my friend told me that he visit Saudia in every Ramzan. I pray that may Allah give this opportunity to everyone who has desire of this. There is a hadith which relates that if you see a person perform Salat five times a day then you should testify his good character so I hope every one who belong to Party has gotten my point. And for those who always used to talk some rubbish things like Kim Barker’s scandal must change their thinking we are not going to answer these. 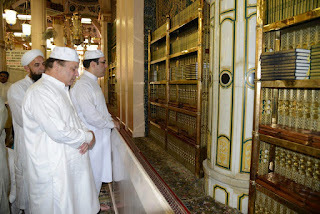 We have firm believe in Mian Nawaz Sharif that he will work for the betterment of Pakistan and Muslims. And we have no objection if he takes help from a Muslim and Sincere country like KSA. Its much better to visit Saudia rather then America for begging as our Prime minister, president and their cabinet do.